You do realize how obscenely funny these are? They're my favorite part of your site. 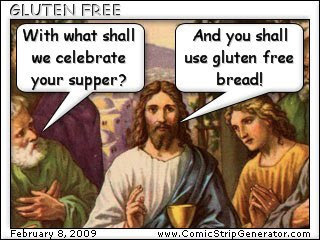 To be fair, though, some people do have a real problem with gluten, and couldn't receive the the Body of Christ if a gluten-free option weren't available to them. So it's beautiful that, because of nutritional technology, they can receive under both species.